Ever since Chelsea was young, God blessed her with the ability to train dogs. Although Chelsea felt called to ministry work at the age of 14, she wondered how God was going to use her gift for animal training to love his people. 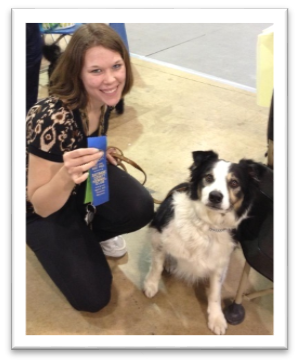 The Lord showed how dog training can spread joy and healing through Chelsea’s border collie, Dude. When Chelsea was 14, she trained Dude to do several tricks including praying, throwing away trash, and performing service dog tasks. Chelsea and Mama Chita took Dude to a nursing home to show off his talents. At the nursing home, Chelsea realized the magic a dog can bring to a person’s rehabilitation. During one of these nursing home visits, Chelsea and Dude encountered a lonely lady who was sitting very crooked in her chair. During their first visit, she didn’t speak and wasn’t able to throw the ball for Dude, but she couldn’t take her eyes off him! During their second visit, she sat straighter and welcomed Dude into her room exclaiming, “Dog!” They saw a noticeable difference when she was able to grasp and release the ball in order to throw it to Dude. To everyone’s delight Dude caught the ball and placed it back in her lap. During subsequent visits, she began to engage in a conversation with us using new words like “ball,” “fetch,” and “thank you.” Eventually, she gained so much strength and coordination that they had to shut her door to keep the ball from flying into the hall when she threw it! That was when Chelsea knew that she was called to have a carreer in animal assisted occupational therapy. Touched by the hope that a dog brings to someone’s day, Chelsea wondered how effective horse-assisted therapy could be. At 19 years old, Chelsea became a certified PATH (Professional Association of Therapeutic Horsemanship) Instructor. Chelsea started a therapeutic riding program at River Valley Ranch while she attended Towson University and earned a Master’s degree in Occupational Therapy and a specialized certificate in Autism Studies. In January 2017, Chelsea and her family listened to the Lord’s calling to pull resources together and buy Timberbrook farm in an effort to expand and use trained animals to spread the joy and hope of the Lord with others. The ministry is called Taking The Lead, Inc. at Timberbrook farm. Taking The Lead, Inc. is a 501(c)(3) nonprofit organization. Taking The Lead, Inc. is ran by a dedicated board of directors who understand how trained animals can encourage and motivate patients. Animal-assisted therapy allows clients to meet their goals and gain independence, success, and confidence in a unique way.